Welcome to W.W. Shock Absorbers. We have been serving the Brisbane public and trade since 1959. 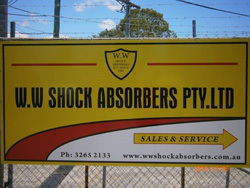 We are Brisbane's original Shockabsorber Reconditioners. We can help you save big dollars when it comes to replacing your worn shock absorbers. Did you know that most brands of shock absorbers can be re-manufactured? We can supply you with our re-manufactured shock absorbers or can re-build your old shock absorbers. Either way we can supply a shock absorber that is guaranteed to be equal to or a better standard than a new shock absorber at a fraction of the new price. We back this up with a comprehensive 12 month / 20,000 km peace of mind warranty. We have an extensive range of reconditioned shocks in stock and we also offer a fitting service if required. In the unlikely event we don't have your type of shocks in stock we will re-manufacture yours. We are conveniently located at 33 Matheson Street, Virginia which is just a stones throw from the heart of Brisbane. If you can't make it to us we can ship to you Australia wide via your choice of transport. We have EFTPOS facilities and accept Mastercard, Visa, cheque, cash or EFT payment. 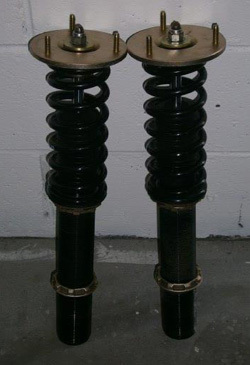 We Re-Manufacture and fit Shocks & Struts for Cars, Trucks, Motorcycles. 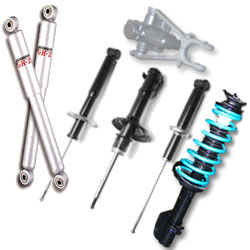 We can recondition virtually any type of shock absorber including lever arm shocks. We also sell new shock absorbers including the most popular brands of shock absorbers and springs. Boge equivalent EFS & Enforcer shocks by Carrolls Springs, KYB equivalent shocks, King Springs etc. We sell brand new (not reconditioned) Gas Stays - Tailgate & Bonnet supports at reconditioned prices. If you have an imported Japanese vehicle we can convert your Air-Bag suspension to conventional suspension.